Indianapolis is a city that constantly defies expectations! There’s so much to explore and enjoy, and so much of it is within walking distance of the convention center, that we almost don’t want to tell you. Fortunately we’re confident that PLA Conference programming is packed with its own tempting array of activities and events to keep you around! 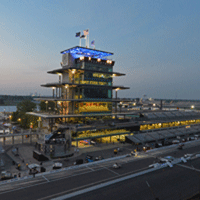 To get an inside look at Indy, check out the official Visit Indy site. Hop on and off a free conference trolley at select downtown sights perfect for the visiting librarian! Thanks to generous sponsorship from the Indiana Public Library Association (IPLA) and The Indianapolis Public Library Foundation, there will be a free trolley service taking conference attendees to a handful of exciting venues during the PLA conference. Five miles from the convention center and situated on 152 pristine acres of gardens and grounds, the Indianapolis Museum of Art is a special place to visit. The collection of 54,000 works spans 5,000 years of African, American, Asian, and European history, making it one of the largest encyclopedic museums in the country. And did we mention admission is free? An interactive Public Art Locator makes it easy to tour the city and explore Indy’s incredible array of public art. Additionally, the the Canal & White River State Park, located in the heart of downtown, offers 250 acres of green space and attractions all connected by a glimmering canal walk and art-lined pedestrian pathways. We have a whole page dedicate to restaurants, because there are simply so many to choose from. 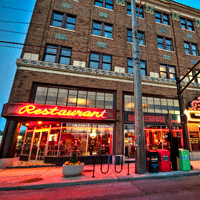 Indianapolis offers over 250 diverse dining options for all palates and price points. With its rich soil and surrounding agriculture, Indy has been supporting farm-to-table restaurants for decades, with local farmers providing the freshest in produce and protein to menus. International fare, world-famous steakhouses, and sports bars are also just around the corner. 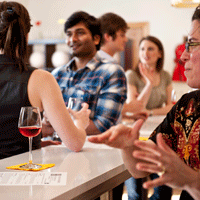 Wine and beer enthusiasts alike will find plenty of handcrafted, award-winning creations to sample throughout Indianapolis. New Day Meadery specializes in honey wines and hard ciders derived from Indiana orchards and honey farms. And a brewing renaissance in Indy has resulted in over ten craft breweries delivering delicious drafts to restaurants and bars. The Indy Brew Bus is a great way to tour and sample with a personal driver. Located upstairs above the famous St. Elmo Steak House, 1933 Lounge is an intimate, swanky night spot with exposed brick walls that pays homage to the end of Prohibition. And Nicky Blaines is a hidden underground jewel near Monument Circle with a posh 1920’s vibe and specialties in cigars and martinis. For crafted cocktails, some of the best mixologists can be found at Plat 99 and The Libertine. Another favorite is the ball & biscuit on Mass Ave, which made Esquire’s 2012 list of Best Bars. For a more laid-back pub atmosphere, find MacNiven’s and Chatham Tap. A local hangout, Tomlinson Tap Room at City Market, is a hub for sampling craft beer from over ten thriving local breweries. Indianapolis is home to more memorials honoring our nation’s veterans than any other city in the United State, second only to Washington, D.C. Monument Circle is the iconic heart of downtown, and visitors can get a spectacular eagle-eye view of the city from atop the 284-foot Soldiers & Sailors Monument. 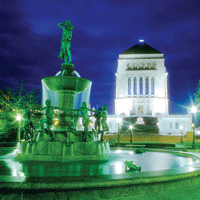 Just a few blocks north, the Indiana War Memorial Plaza Historic District contains two museums, three parks, American Legion’s headquarters, and 24 acres of monuments, statues, sculptures, and fountains. The Central Canal runs through White River State Park and is home to the Congressional Medal of Honor Memorial, where twenty-seven curved glass walls represent medal recipients from 15 different conflicts from the Civil War through Iraq and Afghanistan. Also along the canal are the USS Indianapolis Memorial and the 9/11 Memorial. The world’s largest (and according to Child magazine, the best) children’s museum, the Children’s Museum of Indianapolis, provides five levels of interactive exhibits and 120,000 artifacts exploring art, science, history and culture. Rhythm! Discovery Center allows visitors to beat on drums while learning how rhythm and percussion are part of our daily lives and our history. And of course, don’t forget the Indianapolis Zoo, ranked a Top-10 Zoo by TripAdvisor, which will welcome an unprecedented International Orangutan Exhibit in 2014. 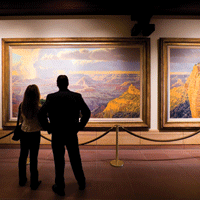 A special destination is the Eiteljorg Museum, the only museum of its kind in the Midwest, immersing visitors in Western art and the many cultures of American Indians through exhibitions, performances, festivals and hands-on workshops. You can also uncover Indiana’s secrets through hands-on exhibits exploring the state’s diverse history at the Indiana State Museum, a world-class institution constructed from Indiana limestone, steel and glass. History and literary buffs can tour the Kurt Vonnegut Memorial Library as well as the homes of James Whitcomb Riley and President Benjamin Harrison, all Indiana natives. 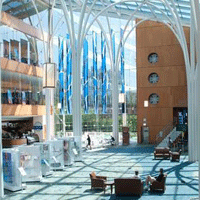 Explore Indiana’s literary history at the Indiana State Library and the Indianapolis Public Library. The Indiana State Library is conveniently located next to the Indiana Capitol Building and houses a world class genealogy and Indiana history research collection. The Indianapolis Public Library is a short walk from downtown and boasts unique architecture that combines old and new, having been built in 1917 with a modernized addition in 2007. Indy offers a wide range of music venues suitable to all musical tastes, from intimate stages and underground bars to mega stadiums playing popular national acts. Discover up-and-coming indie bands at Radio Radio and Do317 Lounge in Fountain Square, or listen to jazz at Madame Walker Theatre, Chatterbox and Jazz Kitchen. Lively cabaret singers are on stage at Chef Joseph’s and The Cabaret! at Columbia Club. 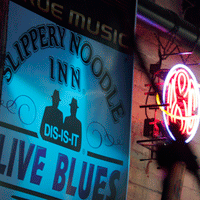 For blues, the historic Slippery Noodle Inn is the go-to spot with nightly shows. This famed blues bar has history as part of the Underground Railroad and gangster John Dillinger’s favorite watering hole. In fact, two stray bullets from Dillinger’s gun can still be found in the bar’s wall. For those wanting something a little more classic, the Murat Theatre, Clowes Hall and Hilbert Circle Theatre are beautiful backdrops to great performances from the Indianapolis Symphony Orchestra, Indianapolis Opera, and more. As one of the country’s most walkable cities, Indianapolis offers lots of opportunities to explore outside. Tour the 8-mile bicycle and pedestrian-friendly Cultural Trail that connects visitors to hotels, restaurants, attractions and cultural districts. White River State Park offers 250 acres of green space, attractions, and special event venues, all within walking distance of downtown hotels. Visitors can rent bicycles, kayaks, pedal boats, Segways and even gondolas to cruise the Central Canal and tour the park. There are also over 30 miles of greenways and trails winding through the city for runners and avid bicyclists. 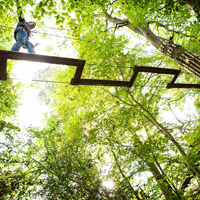 And just northwest of downtown is the nation’s sixth largest state park, Eagle Creek, which offers 3,900 acres of trails, a 1,400 acre lake, ropes course, and ziplining. 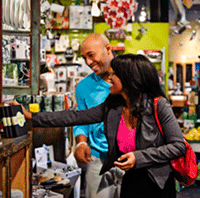 Indy offers a variety of shopping destinations from the largest mall in Indiana to small, independent boutiques. The four-story Circle Centre Mall is the shopping hub of downtown with over 100 specialty shops and dining options. The city has more unique, locally owned stores than ever before lining the streets of cultural districts. Visit Mass Ave, Fountain Square and Broad Ripple to find clothing, art and gifts. For an only-in-Indy souvenir such as a handbag, shower curtain, or iPad case, look to People for Urban Progress. This local nonprofit salvaged the roof fabric of the NFL Colt’s old stadium and five miles worth of Super Bowl banners from landfills, cleaned it, and is repurposing it into unique one-of-a-kind products. You’ve come to the right place! Right downtown, the NCAA Hall of Champions showcases all 23 collegiate sports and the heart and dedication it takes to be a student-athlete. The Hall offers two levels of interactive exhibits to engage visitors, including golf, skiing and baseball simulators and a chance to shoot free throws in a 1930’s-style basketball gym. And let’s not forget the need for speed. The Indianapolis Motor Speedway Hall of Fame Museum captures the rich 100-year-old history of the world’s fastest sport in the ‘Racing Capital of the World’. And Dallara IndyCar Factory uses 23,000 square feet of interactive and hands-on exhibits to convey the intense engineering and technology behind the sport. Live theatre is thriving in Indianapolis, and talent can be found around every corner. From professional productions to eclectic and quirky performances, there is something for everyone to enjoy. 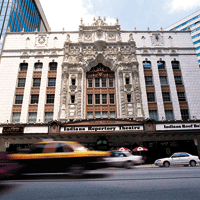 Touring Broadway productions come to Indianapolis to deliver memorable theatrical experiences at the Murat Theatre at Old National Center and Clowes Memorial Hall. After 40 strong seasons, the Indiana Repertory Theatre continues to offer top-notch performances that entertain, challenge and delight. And the Madame Walker Theatre Center, a National Historic Landmark named in honor of America’s first self-made female millionaire, showcases important African-American culture and history through performances. Comic characters and superheroes will be taking over Indianapolis during the 2014 Indiana Comic Con, March 14–16, at the Indiana Convention Center. Tack on some extra time at the end of your PLA Conference trip to meet “comicdom-related celebrities” and explore an exhibits hall catering to fans of comic books, magazines, toys, games, Star Wars, Star Trek, anime, manga, cosplay, artwork, sketches, and apparel. For complete details and tickets, visit www.indianacomiccon.com.